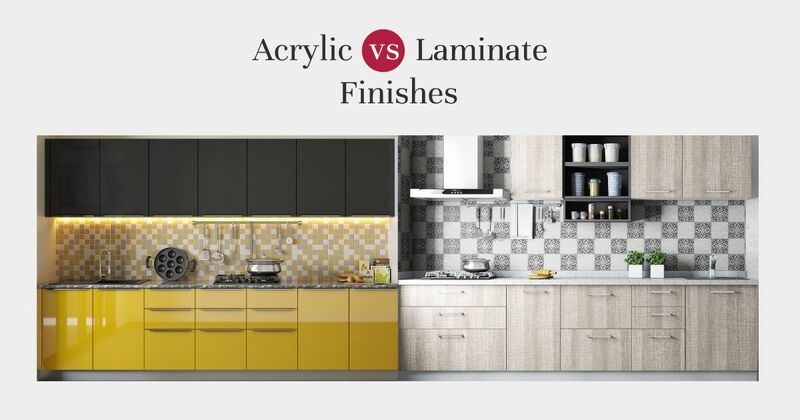 Acrylic Finish VS Laminate Finish: Select Best for your Kitchen Cabinets! There are various components of a kitchen which assemble together to create a stunningly beautiful looking modular kitchen. The cabinets are the most essential parts of a kitchen which decide the overall look and appearance of the kitchen and differentiate between the average looking and a great modular kitchen. It is important to take some time to choose the best finish for your kitchen cabinets. Presently there are various cabinet finishes available in the market such as acrylic finish, membrane finish, laminate finish, stainless steel finish, etc. To install kitchen cabinets, there is a whole wide range available in different finishes and different materials all together you can select from. If you don’t want wood, you have plastic. If not plastic, how about glass? Acrylic finish and laminate finish are the most popular options among all the finishes of kitchen cabinets. Visual appeal, pricing and durability are some of the aspects in which they differ from each other. It is important to learn a few of the things about both the finishes to choose for a cabinet that compliments the kitchen aesthetics and increase its décor value. Acrylic is made up of Polymethyl Methacrylate material. It is commercially available as Crylux, Plexiglas, Lucite, etc. This material is presently achieving importance in the field of the modular kitchen. It gives a high gloss finish to the kitchen cabinet. This finish is quite similar to lacquer(coating) finish. The acrylic finish should be your choice if you are looking to make your cabinets look perfectly smooth and reflective. On the other hand, laminate finishes are quite different. It is a composite artificial material made by pressing thin layers of plastic resin and paper together having a pattern and/or colour on top. 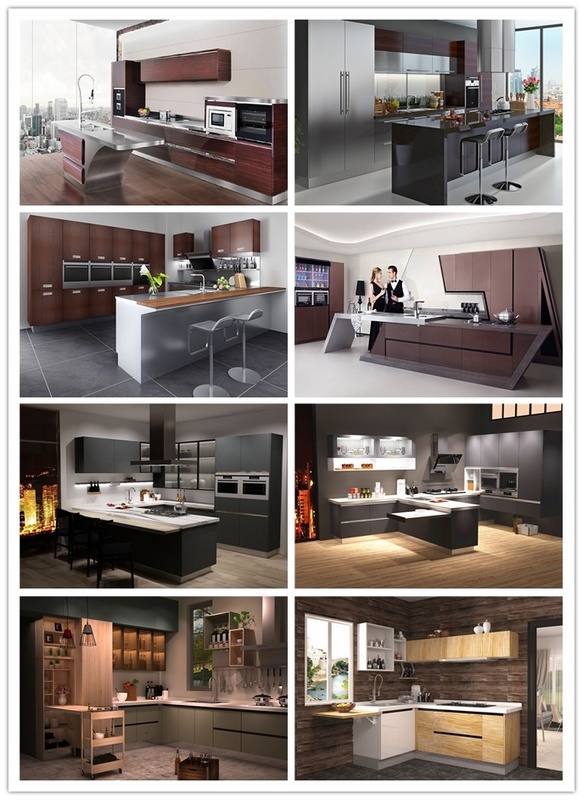 Kitchen cabinets with laminate finish are made by pressing them in factories using high pressure automated machinery. Acrylic cabinets with premium high-gloss finish are the preferred option for high-end kitchens as it can add visual space and an appealing interest hence increasing the décor value of the kitchen. Laminate cabinets are also available in gloss finish but the look is dull, less reflective and less-striking as compared to acrylic cabinets. Acrylic finishes are scratch-resistant. Any fingerprint marks or stains are easier to clean and remove from acrylic finish modules. Use a mild soap & water mixture with a gentle cleaning cloth for cleaning of surfaces. In comparison with Acrylic finish, a laminate is highly resistant to scratch and abrasion. Sweeping or vacuuming is typical and it is all that takes to clean the laminate. Acrylic finishes retain their colour and smooth gloss for a long period of time. Most acrylics used in the market for furniture are generally UV stabilized for good weather ability and resistance to exposure of prolonged sunlight. They have good resistance to moisture and heat and can be treated for antibacterial properties as well. Acrylic finishes are available in plenty of colours that are bright and vibrant and they retain their colour and gloss for a long period of time. The variety in laminate finishes available is higher and includes matt, glossy, ultra high gloss. Along with a various range of colours, they are also available in various textures including that of wood. Acrylic finished cabinets are way too expensive when compared to laminates as they offer various properties such as reflective and smooth finish, easy to clean, etc. Hazing or fine scratching and colour of sheet keeps on eventual changing to yellow if the surface is cleaned using glass cleaning spray or products containing ammonia. Once the top layer of laminate has worn out, the whole sheet needs to be replaced. Nowadays, there is a trending combination of both acrylic and laminate finished cabinets in a modular kitchen. Acrylic finish is preferred to use for upper cabinets for their glossy and attractive look as lighting tends to highlight them. Lower cabinets can be made of laminate finishes due to its continuous use as they are highly durable and has good resistance to wear and tear. Above listed were the points to be considered for selecting the acrylic finish and laminate finish for your modular kitchen. Depending on your use, budget and taste, decide on the best finish for your kitchen cabinets to enhance the overall look and feel of your modular kitchen. Previous PostPrevious Stone Masonry Construction: 40+ Various Guidelines to Keep in Mind! Next PostNext Galaxy Painting: Turn Your Room into a Night Sky!